Customer retention is a vital part of any thriving business, but getting people who visit your business to come back can be hard. The start to a good customer retention strategy is as simple as putting yourself in their shoes. What does a visitor experience when he or she enters your business? What strategies are at work to make a it more welcoming place? This article will delve into the top 3 things to consider when coming up with strategies to nail those return visits. You can spend all the marketing dollars you want on strategies to try and get people in the door; none of it matters if the first thing they see when they get there is something that will send them running for the hills. Never underestimate the power of a first impression. The first things that a visitor experiences within the first few minutes of being in your business are critical. What they see, how they’re treated, and the general vibes of the place are all factors that help determine whether or not you can count on that person coming back. For a more in-depth look into the factors that make or break a first impression, check out this article: Top 5 Factors to Enhance Your Business Environment. In the age of Facebook, Twitter, and Instagram, any business that doesn’t have a presence on social media is at a disadvantage. Social media keeps you connected to your customers when they are outside of your walls. Getting visitors to follow you on social media platforms is a task in and of itself, and depending on the kind of business you have, it can be that much more difficult to get people interested in following. So what’s the trick? First, people need to be reminded that you exist on social media. This can be accomplished by printing pleas for followership on cards, shirts, and various other promotional items; but does that really convince people to follow you? You need to do more than just remind visitors to follow you on social media. You have to give them a good reason to follow you. In truth, a good reason can’t be printed on a flier and handed out – it needs to be experienced. Visitors will follow you on social media when you show them what they get out of following you. Whether that thing is funny pictures, posts about hobbies they share, or even specials that give them a reason to come back – it’s all possible through social media. Customers come back if they have a reason to. It’s your job as a business owner to educate them on why they should return. Literature, brochures, and other types of signage are some of the classic business strategies for customer retention. Customers come back if they have a reason to. For good reason; it’s an effort to get the brand out there, and it can spruce up an otherwise blank waiting area. But relying on things like posters, or promotional items like pens and T-shirts to promote your brand doesn’t cut it. Posters go unnoticed. People throw out literature. And promotional items take up a lot of valuable space. The right approach to signage is investing in something people will notice, something that is informative, and something that doesn’t clutter up your storage space. It’s Relevant TV is a custom TV network that makes for a great first impression, helps generate followers on social media, and gets your brand noticed. First time, and even returning visitors are entertained by the engaging, and informative content. The videos get people to look at the TV; at which point they notice your brand, your messaging, and anything you want them to see. Strangely enough, the messaging that went unnoticed on posters gets noticed the TV. It’s Relevant TV also integrates with your social media accounts. Visitors are able to see recent posts from Facebook, Twitter, and Instagram directly on the TV in between content. This gives demonstrates the reasons for them to follow you, and then they do! 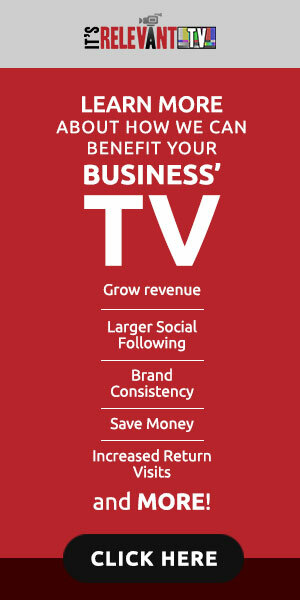 It’s Relevant TV is TV made for businesses and waiting areas. It’s affordable, customizable, easy-to-use, and improves visitor experience, and your bottom line. Visit: itsrelevant.com to explore a better alternative for your TV.